Facts about Olive Baboons. Olive Baboon is a variety of Old World monkey that belongs to the genus Papio of the Cercopithecidae family. "Scientific name of the Olive Baboon is Papio Anubis". Olive Baboon are also called as the Anubis baboon. The Olive Baboons are native to Africa, and they are the most extensively ranging of all primates. It is found in 25 countries all through Africa, extending from the eastern parts of Mali to Tanzania and Ethiopia. Remote populations can also be seen in some hilly areas of the Sahara. Usually, the olive baboon prefers to live in steppes, savannahs and forests. The Olive Baboon is one among the biggest varieties of monkey with the body length with their head, ranging from 20 inches to 45 inches (50 cm to 114 cm). The male Olive Baboons when measured at the shoulder on all fours, the male monkeys have an average length 28 inches (70 cm), whereas the females have the average length of 22 inches (55 cm). The normal body weight of both genders of the Olive Baboons ranges from 22 pounds to 82 pounds (10 kg to 37 kg). Usually, male Olive Baboons are heavier than the females, with an average weight of 53 pounds (24 kg), and the females have the average body mass of 32 pounds (14.7 kg). While standing, male Olive Baboons appear with the height of 28 inches (70 cm), whereas the height of the females is 24 inches (60 cm). The Olive Baboon has a green-grey color coat, and its head muzzles resemble to that of a dog. When observed closely, the coat of the Olive Baboon appears in multicolor, owing to yellow-tan and black color rings on their hairs. They have coarser hair on their face and the hair color ranges from dark grey to black. 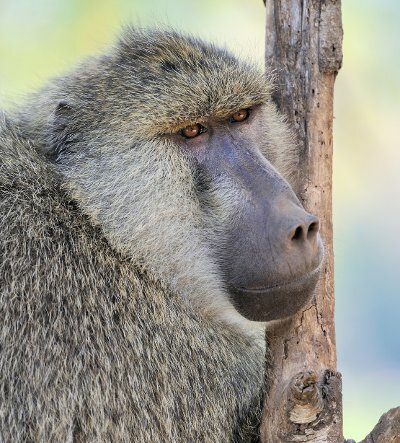 This tint is shared by both genders, even though male Olive Baboons contain a mane of longer hair that narrows down to normal length along their back. In addition to the difference in the mane, the male Olive Baboon varies from the female baboon in terms of the size of canine teeth. The Olive Baboon has a long muzzle, which is similar to that of a dog. Actually, together with the muzzle, the four-legged walk can make these baboons appear very canine. The tail length of the Olive Baboon variety ranges from 15 inches to 23 inches (38 cm to 58 cm), and it appears as though it is broken because the tail looks erect for the initial quarter, after which it descends sharply. The Olive Baboon has a cheek pocket with which it can store the food. The Olive Baboon is an omnivorous monkey, and it feeds on leaves, roots, grass, bark, fruits, flowers, lichens, seeds, tubers, mushrooms. During drought, the Olive Baboons feed particularly on rhizomes and corms, as grass loses an immense deal of its dietary value. In arid, dry areas, the Olive Baboons feed on small invertebrates, such as insects, scorpions and spiders. The Olive Baboon use to live in groups that consist of 15 to 150 monkeys. Usually, the group includes some male Olive Baboons, many female monkeys, and their offspring. Each Olive Baboon has a social status somewhere in the troop, according to its supremacy. Female supremacy is genetic, with female juvenile Olive Baboons having nearly the equal rank like their mothers, with mature female Olive Baboon forming the nucleus of the communal system. The relative of the female Olive Baboon form their individual subgroups in the group. Related females are mostly gracious to each other. They are inclined to continue close together and groom each other, in addition to team up in violent encounters with other group members. Female relatives form these strong relationships, as they do not leave from their biological groups. Occasionally, these groups may split when they become so big that rivalry for resources is tricky, but even then, associates of matrilines are inclined to attach together. The average lifespan of the Olive Baboon ranges from 25 years to 30 years.